AT 33 years of age and after a lifetime of fighting in the ring behind him, Eric Donovan thought he had given all he could to the sport of boxing but the thoughts of being crowned Irish champion at ‘Clash of the Titans’ at the National Stadium this Saturday evening has lifted his training to a new level, a level that he didn’t even know he had in him. “It’s just another boxing fight for me but at that the same time, it’s a big one. I’ve trained harder for this than I have for any other fight, absolutely no doubt about it. I would go as far as to say that I am training harder now than when I represented Ireland. There’s a lot more at stake now and I feel like I have matured now. I really feel like I can get something out of this game, that I can I achieve something, but I know that there is absolutely no room for short cuts, no room for half-heartedness. It’s all or nothing. This game is tough, it’s the hurt business. I have a ten round fight ahead of me against a very tough, rugged, strong fighter,” said Donovan. “The goal for me is to get to European level but maybe I am downplaying my own abilities and my own standards. The work that I am putting in with Ken (Egan) and Joe (Clifford) makes me realise that there is more inside me than I even knew. When you push yourself beyond your limits you start to go to places –internally, physically, mentally – you learn more about yourself. I don’t want to come across as big headed or arrogant but I feel like I am even better than I have given myself credit for. You don’t realise that when you are not putting in the work or the effort but when I am putting in the work I am seeing stuff about Eric Donovan that I never knew existed. That has given me reassurance again that I deserve to be here,” he added. Donovan has delivered some special nights in the National Stadium already and it’s a place that clearly means a lot to him but he knows that Saturday night could be different to anything he has experienced in Dublin before. 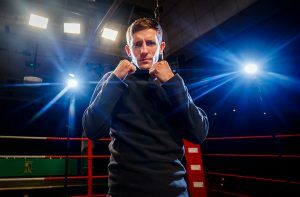 His opponent Stephen McAfee, like Donovan, will arrive on Saturday believing he can win the Irish title and will have the backing of his supporters. The headline fight of the best card in Irish boxing in many years, it is shaping up to be something special. “The National Stadium will always have a special place in my heart. Winning Athy’s first ever senior title there, that was a very special occasion and special experience and a memory that I will never, ever forget. Then there were some great internationals here, beating the world champion Italian Domenico Valentino, the great Cuban, Hernandez, along with my other senior titles. I have some really good memories but I kind of have to shift my thinking now. I’m really settled into life as a pro, my training has changed and everything about me as an amateur is gone. I have to think like a pro, no more nice amateur stylish stuff, this is the hurt business. You keep the fundamentals, hit and don’t get hit, the blocking and the footwork and all that but everything about my performance now is geared towards punishment, hurting the other guy when he misses, taking away his strengths. Being ruthless, being aggressive. It’s all boxing but there is a massive disparity between amateur and professional in that one is sport, the other one is pure business. It really is ruthless,” said Donovan. Being ruthless and trying to hurt your opponent seems like one of the basics of boxing but that’s not always been something that has been easy for Donovan. “I’m always respectful, even in my sparring. Joe and Kenny have been on to me telling me that I can’t be Mr. Nice Guy anymore. Joe said to me ‘You can’t bring your feelings into the ring, Eric. You have to leave them outside the ring’. That resonated with me,” said the Athy man, but he has no doubts that he is blossoming as a pro. “It’s going to be electric and I’ve really dreamed about boxing on nights like this. Now it’s happening for me and I’m just like ‘wow, this is it’. Some people talk about it, some people do it. I’m going to do it. I have a very, very good feeling that this is going to be the start of something extraordinary and special,” said Donovan. Whatever happens on Saturday night, Donovan can be content that he has given everything he could to obtain his goal but perhaps even more importantly than that, he has enjoyed the journey. Now at a stage of his career, and life, that he can take a step back and appreciate all he is doing. “When I mentioned it to my two boys when they were going to school, I was telling them this is an extraordinary life. Even though I have been boxing for years, years and years I still love it, I’m still chasing it, I’m still buzzing for it. So, I have to be present for all of that and soak it all up. It’s amazing, wonderful. “The passion is there in my coaches Joe and Ken which I really like too. We are really enjoying the journey. We tell ourselves that these are the best days of our lives, for me anyway, these are the best days of my life. I want to soak it up and enjoy because something very special is happening,” he said. The buzz of something happening is reverberating around his home town too and all over Athy this week the main topic of conversation is Eric Donovan bringing a professional Irish title back to the town. “My mother is even saying it, when she has been down the town doing a bit of shopping everybody is speaking to her about it. Just to see how proud she is is amazing as well, and she loves telling me as well. She is always telling me that people are talking about me over in the nursing home where she works, in Clover Lodge. “I think that’s lovely and it’s lovely to see your mother so proud. I just want to bring proud moments to my family and Saturday 30 March is another opportunity for me to do that,” he said. It’s a night not to be missed.